Scheduling these two big peaks again for the Climbing-Knapsack Section, only my oft-companion, Rex, took the challenge. We left after work to view thunderheads in the Sierra, to the east. We headed up Highway 16 to Highway 88 and U.S. 395. We enjoyed a nice breakfast In Bishop. In no big hurry, we started, me with my heavy day pack, from the South Lake trailhead. We were starting as late as 8 a.m. Taking the Treasure Lakes Trail, we hiked up past the highest of the lakes to the left, then into a large cirque. 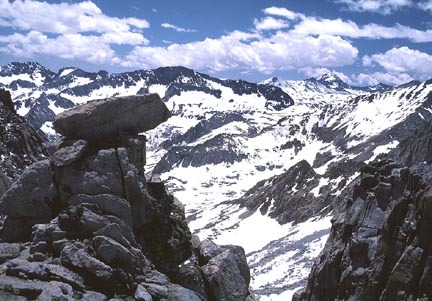 I knew from memory that a diagonal ledge leads up to the Sierra Crest. Yes, I found it again, although I had worried a bit about that. The class 3 was easy enough for Rex. There were plenty of clouds, but none of them looked like rain. There was little or no wind. I had already done these peaks, but it would be some kind of credit to do them again as a lead for the chapter. 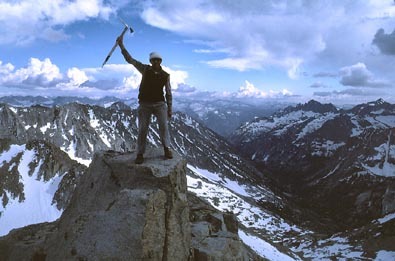 I was to do them again, 3X, as a lead for the California Mountaineering Club in 1994. I was once considering seeing if anyone needed to bag these two listed peaks in one day, for my 4X. I have the route down pat. I figured that I could do the gain and miles. But, would there have been anyone ready for the one-day challenge? Rex was hot, getting ahead on the sand slopes up to the top of Gilbert. Our time to there was about five hours. The view of the crest toward Mt. Thompson was awe-inspiring. After taking more pictures, I led us down. We traversed back along the crest to come to the blocky ridge of Mt. Johnson. A swell of big clouds were forming to the west. There was enough blue sky so we weren't real worried about lightning. We had a couple escape plans to get down fast. The light was getting heavenly. Rex scrambled up the blocky talus, and kept right with me. I thought it was novel for such an older person to do so well. We came to the blunt knife edge, and Rex came across, with a photo by me. The clouds to the west were thickening somewhat. But, the air was calm, which I guess is a good sign. Big, billowing clouds floated about. It was one of the greatest, dramatic, photo opportunities that I have ever had. Years ago, I had a compliment for my then home page photo, which I used from this trip. We came to the top. Gorgeous, beautiful, fantastic! Would I want to get my film back from this one quick! Rex posed on the highest point. I send people the prints as I get them developed. I don't charge anything--the pleasure of doing this service of mountain photography is enough for me. One could hardly do better with PhotoShop, using composite elements. I stood on the summit, highpoint, rock pedestal for Rex to take my picture. I made the settings, but Rex had a problem thinking on composition. I feared that he might fall off from where he was standing. His geometry isn't very good. Luckily, he snapped the pictures without falling, or dropping the camera. I should carry a tripod. Soon, it was after 5 p.m. We knew we had better start down, as the sunset was some three hours away. The south side of Mt. Johnson is largely sand and scree. But Rex was slow now. He is not so game over large boulder fields. We came back to the Treasure Lakes Trail, then raced the sunset to the cars. I always carry a headlamp, but sometimes Rex doesn't think about those things. A few pictures of the red evening glow on the clouds were shot, then we came back to the car. It was late even for Bishop. We had to go to the 24 hour coffeeshop for dining. I mistakenly decided to have several cups of coffee. That was stupid. I went to our car camp, happy. I couldn't sleep that night. I was giddy thinking and laughing about our adventure. When the sun came up, I still hadn't slept. It then began to affect me. We took Highway 120 across Tioga Pass to get home. I stopped for a short hike to the top of Lembert Dome. The erratics on top made a good picture, in the soft light. This was provided by the same drifting clouds, similar to yesterday. It was real Hell driving again. Coming to the hot Central Valley, I took a coffee break in Oakdale. It didn't help. I perservered and completed the drive. Getting home, I had a hard time adjusting. I fell asleep at an odd hour. Again, sleep deprivation is torture. If I had the money, I would have checked into a motel and slept away. It was a few years more, and I would be placed on the retirement rolls at work. Sleep wouldn't be that much of a problem, then. I didn't have to maintain a rigorous work schedule anymore. I had seen a doctor stemming from sleep problems when I was in school. I try to cut the caffeine, but it's a catch-22. If I don't get up early in the morning, then I don't sleep well that night. And, peak climbing and fatigued driving don't mix real well.